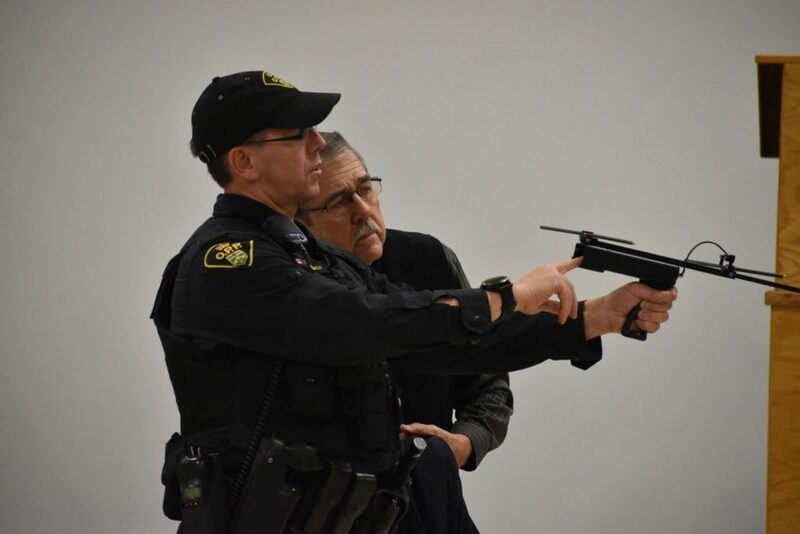 About two dozen Prince Edward County residents received a first hand look at an Ontario Provincial Police-administered track and search initiative at the Highline Hall on Tuesday. The Hastings and Prince Edward chapter of the Alzheimer Society of Canada presented ‘Finding Your Way’, a two hour session that offered tips and instruction on how to help those suffering from dementia as well as a live explanation and demonstration of Project Lifesaver. Project Lifesaver is an internationally renowned method of identifying at risk individuals that might wander including those suffering from dementia or some individuals identified on the autism spectrum. The technology works through a radio frequency chip in a bracelet worn by an individual. If the person goes missing, Prince Edward OPP officers can use radio frequency technology to track down and find the person before harm or exposure might come their way. Morgan Haviland, Fund Coordinator for the local Alzheimer Society chapter said Tuesday’s public education session was funded through a County Foundation grant and it was hoped that individuals, care givers and families that have someone in their life that might be at risk of wandering would consider enrolling in the program. Currently, Prince Edward OPP has about a half dozen local program participants wearing specialized radio transmitting wrist bands registered on the Project Lifesaver database. The information on the database includes an up-to-date photograph, biographical information and patterns that might help searchers at the start of a search in case the individual goes missing. Once the search commences, OPP officers are able to use specialized receiver units that can be programmed to emit a beep when tracking a unique frequency. 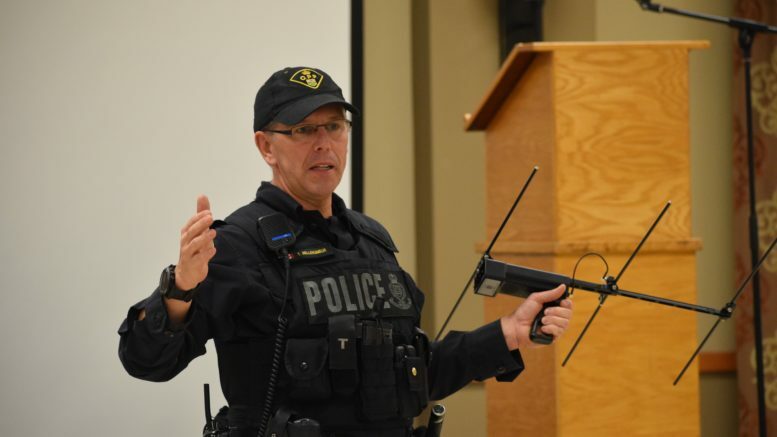 “We wanted to host this even in conjunction with the OPP to show the public exactly what this technology can do,” Haviland told the Gazette. After providing an overview on the creation of the program and instances in the region where it’s greatly aided searchers, OPP Project Lifesaver Lead Troy Bellehumeur conducted a mock search for Prince Edward Detachment commander John Hatch who had fled the Highline Hall and holed up somewhere inside the Lehigh Arena. Within minutes, Hatch was discovered by Constable Bellehumeur in the facility’s elevator. Bellehumeur is one of 45 officers trained for the East Region’s Emergency Response Team, a group of officers that typically deal with a multitude of missing person cases as well as other high risk calls. Initially trained on Project Lifesaver in 2013, Bellehumeur is a proactive program that tend to wander and are at high risk. Bellehumeur explained the local Alzheimer Society managed the program and all the forms and paperwork associated with it while the OPP handles the search aspect once the initial call is made. In total, Ontario police officers have conducted over 2,500 Project Lifesaver searches that have ended in success and Bellehumeur said several of those have been undertaken in the Quinte area including one recent search in Madoc that was successful in finding a missing female within minutes. But early reporting is the key. The session also included Constable Scott Gannon, one of six OPP canine officers in East Region provided a demonstration with a pair of his animals. 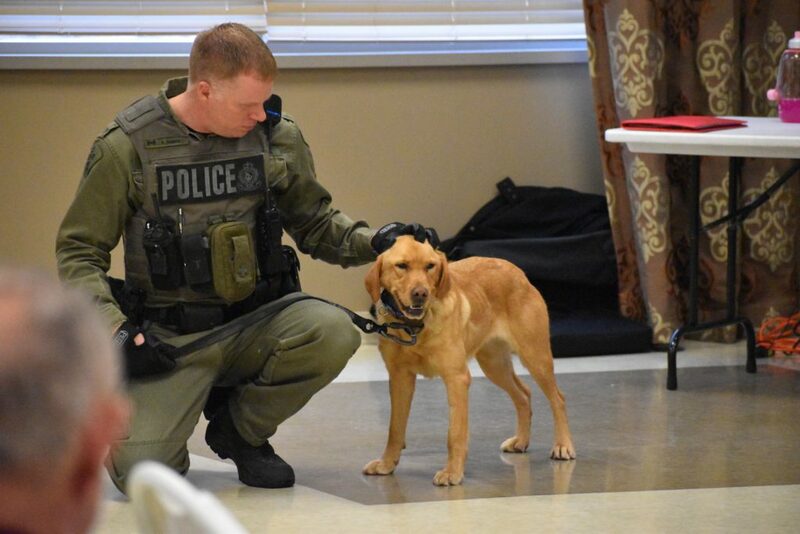 Zoe, a specialized search and rescue dog that tracks people as well as guns and drugs and Bullet, a general service police animal made appearances at the Highline Hall on Tuesday much to the delight of those attending. Alzheimer Society Education and Support Coordinator Lorraine Ross also offered a presentation on what the public should know and understand about individuals they might discover in public that are suffering from dementia and are presenting as confused. Ross offered tips on understanding the disease, how to effectively communicate with someone suffering from dementia, how to help people with the disease live safely in the community and what steps should be taken if a person with dementia is lost. Those interested in exploring Project Lifesaver for their at-risk of wandering loved one whether they be suffering from an Alzheimer or related dementia disease, on the autism spectrum or suffering from Down Syndrome are encouraged to contact the local chapter at 613-476-2085.